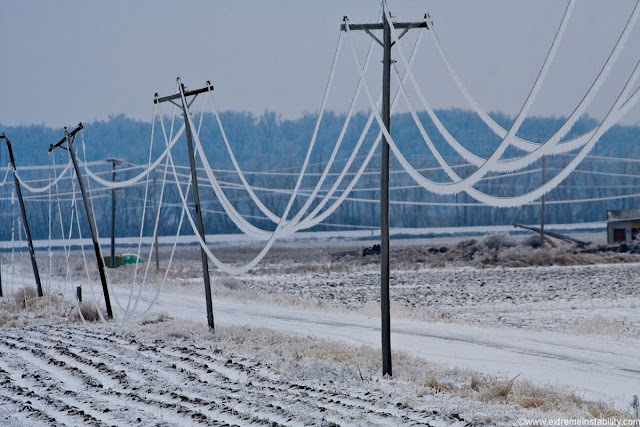 In the ice storm of December 2007 almost 59,000 homes and businesses were without power in the Northwest Missouri area which included the towns of St. Joseph, Maryville, Savannah, Tarkio. Ice ranged from more than a half-inch in St. Joseph to 2 inches farther north, said Tom Kelley, Aquila's regional manager. More than 1 million people were without power from Oklahoma to Illinois ("We've never...", 2008). "From my perspective, we've never had a storm like that hit our entire system," Kelley said. The electric utility and weather services sent out press releases to warn people to be ready for the storm, but no one was really prepared when the storm hit Tuesday, December 11. At Northwest Missouri State University in Maryville 7000 students were preparing to take exams. About 90 percent of the students were from outside the region and were anticipating going home for the holidays. Almost 2000 students lived in campus housing, while the remainder rented apartments in Maryville. A smaller number commuted on a daily basis. Fortunately, at the University power never did go off. However, classes were cancelled. It was dangerous to walk across campus, not only because trees blocked the sidewalks, but the walkways were so icy no one could stand up. After a couple of days highways and roads were sanded and salted so that students could go home. In the meantime, food supplies ran low in the town and the campus cafeteria. A shelter was set up in the National Guard Armory on the west side of campus. Guardsmen went door-to-door throughout the community and rural area checking on people and helping those without resources, mainly older people, to move to the shelter. My wife and I lived in Maryville, where I taught for the university. We never lost our telephone land-line, but our electric power was off for four or five days. With temperatures well below freezing, the house soon became chilly inside. We slept in our family room where we had a gas fireplace. From a call to my wife’s brother in West Virginia, we learned how to by-pass the electric switch in order to light the gas. We had plenty of can goods in the basement, but didn’t have a way to cook food – not even a camp stove. We were concerned about the food in our freezer and fridge. Thankfully, power came back on before we had to move the freezer food outside. On the second day, we were able to get to the campus, where members of our church gathered for the next three or four evenings in a classroom for potlucks and movies. The electric utility learned from a December 1994 ice storm where 15,000 homes and businesses lost power from up to a quarter-inch of ice. In 1994, the electric utility didn't appear to fully grasp the extent of the damage on the first day, when it said they would have power on within a day. In fact, it took six days. Aquila Light & Power brought in about 180 linemen, most in from other area utilities. Kelley described the 1994 response as "more reaction instead of being ready." In 2007 the utility was somewhat better prepared. In 2007, Aquila issued a press release in the hours leading up to the storm that it had 90 electrical workers and 85 tree trimmers en route to Northwest Missouri from other areas. Within three days, Aquila had 275 tree trimmers and 667 electrical workers involved in the recovery effort in Northwest Missouri, including 454 contract electrical workers from other companies. Still it took over a week to get power on in some areas. The major reason for power failure is tree limbs falling on power lines. Also, power lines sag and break because of extra weight. The electric utility has a 4-5 year rotation where they clear limbs 8 feet around power lines, mostly so trees don’t grow into the lines. This is not enough to prevent damage from falling trees or limbs in an ice storm. When I talked to the campus police chief afterwards, he admitted that the University was “just plain lucky.” If power had gone off on the university campus, if temperatures were lower, and the ice storm had been longer, conditions could have been very bad for students and the community. University officials had deliberated about sending students home, when they were warned about the ice storm. They had a window of about three hours when they could have done that on Tuesday morning, but they hesitated and their indecision meant students would have to stay on campus for two or three more days while they waited for road conditions to improve. As it happened, exams were cancelled and had to be re-scheduled in the new year. A side effect to the university was damage to the trees on campus. The Missouri State Legislature named Northwest the official state arboretum in 1993. The Northwest campus features more than 1,800 trees and more than 150 species. 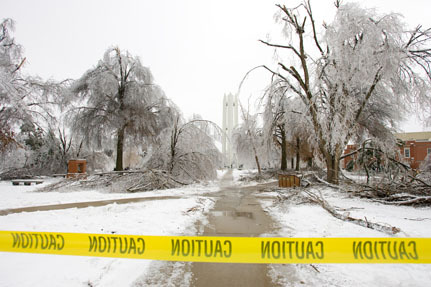 In the ice storm of December 2007, 40 perecnt of the trees were damaged or destroyed. Students, employees, alumni and community members purchased 275 new trees to be planted on campus (Roush, 2015; Northwest, 2018). Officials and the public generally underestimate the possible severity of weather conditions. Typically communities are unprepared, underfunded, and lack resources for major emergencies and disasters. In Superstorm Sandy, it took two to three weeks for stores to reopen and utilities to get services back online. Government officials seem to be unwilling to make the tough decisions to prepare our nation, states, and communities for disasters. Also, the public has a feeling of malaise or apathy. This won't happen to me, they say. If something does happen, the government will take care of me. They have an attitude that first responders will always there to help. 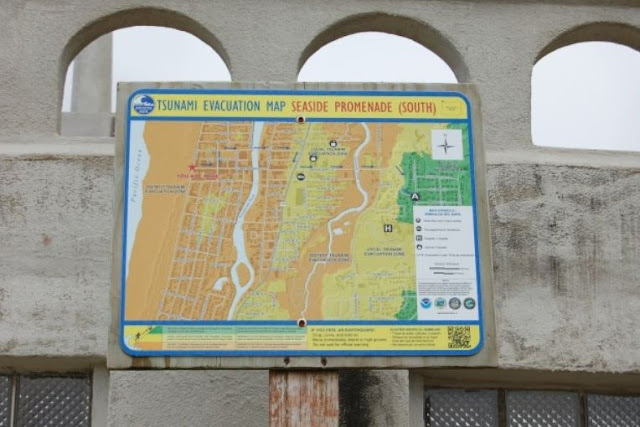 We can prepare for and mitigate to handle natural disasters like floods, wildland fires, storms, and even earthquakes, but it requires hard decisions like not building or living in the path of disasters. In the case of ice storms, we need to put all power underground or cut down all trees near power lines. Every municipality needs reserves of sand and salt and the equipment to keep roads clear and maintained. Every state, every municipality should have funds in reserves to deal with catastrophes. And they need to do a better job of working with the private sector to deal with and mitigate against disasters. Such was the case in the ice storm of December 2007. Officials underestimated the severity of the storm. The city of Maryville (with a permanent population of 11,000) had a budget of only $25,000 for the entire year for street maintenance. Most of it was used in the ice storm (LeCerf, 2008). The city has no reserves for these kind of contingencies. This is typical for other communities and municipalities throughout the country. Reserves in terms of money, personnel, and equipment should be available in every municipality, even required. Training of community members (using courses like CERT) should be pushed, because first responders cannot help everyone in major emergencies and disasters. Debris clean-up is another matter that has long-term impact on the people and the resources of the community. University officials were derelict in their responsibility for students under their care during the 2007 ice storm. Rather than focusing on the impact of having no exams, they should have considered the possible impact of a major ice storm on their students. Planning and exercising for these kinds of situations would prepare university officials to make these hard decisions. Since 2007 Northwest Missouri State University has closed its cafeteria, turning food services over to fast food vendors. The university no longer has a way of taking care of the food needs of their students over a long period of time. Training and exercises needs to be a part of the regular routine of staff, faculty, and students at universities and colleges. As a family, we were unprepared for an ice storm. Fortunately, after four days the electrical power came back on. Had the effects of the storm lasted longer, we would have been in trouble. While we have a food supply, we had no water surplus; no way of cooking food, nor keeping really warm. We would have suffered if the storm had lasted a week or even longer. As families, we need at least three weeks of food and water on hand. We also need to have a way of keeping warm and cooking if we have to shelter-in-place. We would do well to practice for handling catastrophes. A three-day camp out at home in the midst of winter, with no power or gas or water or cell phones, would be a great way to test our resources and resiliency. A 72-hour disaster supply kit is not enough if a disaster happens.